Brought to North America by early colonists, this invasive alien plant is now spreading across the continent at a rate of 6,400 square kilometres per year — that's an area 10 times the size of Toronto. The success of garlic mustard is multi-faceted. Aside from having no natural predators in North America, its low palatability and toxic cyanide production make it an unfavourable choice for most native herbivores. In its first year, garlic mustard forms a rosette of leaves that hug the ground. In the following year, the mature plants produce a flower spike up to one metre tall. The green leaves are heart-shaped with toothed edges and have a garlicky odour when crushed. The plant has clusters of small white flowers with four petals. Like a beautiful flower patch overrun with weeds when untended by a gardener, garlic mustard can spread quickly throughout the forest understory. 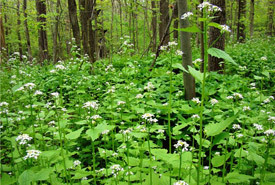 Its spread is facilitated by dense white-tailed deer populations that can over-browse native woodland plants while leaving garlic mustard ungrazed, and by intense recreational uses that disturb forest soils and spread garlic mustard seeds. Garlic mustard is an early riser, taking advantage of the open canopy of springtime deciduous forests, taking full advantage of the first rays of sunlight after the winter snow has melted and getting a head start on native plants emerging after it. Garlic mustard can even change a forest's composition over time, creating a more favourable environment for itself, while driving other species out of the understory. This can even extend to composition of the forest, as garlic mustard can interfere with the germination of tree seeds. Garlic mustard occurs in southern and eastern Ontario as far north as Sault Ste. Marie, in parts of Quebec, and south to North Carolina and Kentucky in the United States. Isolated populations have been found in British Columbia, Nova Scotia, Prince Edward Island and New Brunswick. Garlic mustard's negative impact on rare West Virginia white butterflies occurs in two major ways: the reduction of native host plants in the forest understory, and the direct impact of the harmful chemicals produced by the garlic mustard plant. This is particularly detrimental because of garlic mustard's similarity to the rare butterfly's preferred host plant, native toothwort. Garlic mustard closely resembles toothwort, enough so that it can confuse West Virginia whites. As toothworts become increasingly rare in an understory dominated by garlic mustard, more and more West Virginia whites lay their eggs on garlic mustard. But garlic mustard does not sustain the West Virginia white caterpillars. The hatching rate of eggs is significantly less on garlic mustard plants than on toothworts, and those caterpillars that do hatch are poisoned by the toxic chemical present in the garlic mustard leaves they eat. In the case of the West Virginia white, NCC is actively working to reduce habitat fragmentation, and to control garlic mustard populations in our own protected areas as well as surrounding areas. NCC participates in invasive plant working groups, attends conferences and produces reports on garlic mustard and other threatening invasives. By working with partners, landowners and volunteers, NCC is making an impact in the fight to control garlic mustard. This work benefits not only the West Virginia white, but all native species, plant and animal alike, including eight other rare butterfly species, two of which have already been extirpated from Ontario. To find out how you can help control garlic mustard on your own property or in your neighbourhood forests, visit the Lake Huron Centre for Coastal Conservation's garlic mustard webpage. Report sightings of invasive plants to your local stewardship council. Finding these invasions early is a key to eradicating them.